Norway, which has donated many millions of dollars for rainforest protection, is taking another step forward on that. It is the first government with a Zero Deforestation procurement policy, thanks to campaigning by Rainforest Foundation Norway. 40% of the world’s deforestation can be attributed to the production of beef, palm oil, soy, and wood products in just seven countries with high deforestation rates: Argentina, Bolivia, Brazil, Paraguay, Indonesia, Malaysia, and Papua New Guinea, reports ClimateAction. “Over the last few years, a number of companies have committed to cease the procurement of goods that can be linked to destruction of the rainforest. Until now, this has not been matched by similar commitments from governments,” says Nils Hermann Ranum of Rainforest Foundation Norway. 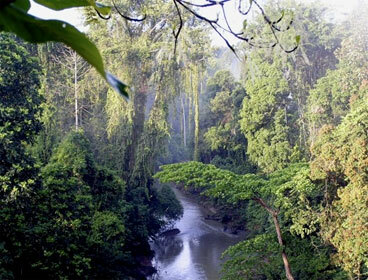 The country is often the first to come forward with funds to protect forests. It donated $150 million through 2020 to help halt deforestation in Libya, supported development of Global Forest Watch and funds efforts to stop illegal logging, for example. Norway’s Standing Committee on Energy and the Environment is also urging the government to protect biodiversity through its massive pension portfolio. It was the first major pension fund to divest from coal. In March, it divested from First Pacific Group because its subsidiary IndoFood – which produces PepsiCo’s snack food sold in Indonesia – hasn’t implemented ethical palm oil policies. It is one of the largest Indonesian firms tied to conflict palm oil (human rights abuses including forced child labor, species extinction, habitat destruction, forest and peatland destruction and climate pollution). Palm oil is ubiquitous in the food chain because it’s an inexpensive oil. It’s found in most processed foods and personal care products and while Indonesia is the center of the industry, it is expanding into many countries, such as Guatemala, Peru and African nations. In terms of palm oil, many companies have pledged to eliminate bad actors from supply chains, but they are moving far too slowly, says Greenpeace in its most recent scorecard. Most companies won’t be deforestation-free until 2020, which is “nowhere near urgent enough,” says Greenpeace. The palm oil industry is the leading cause of deforestation and peatland destruction in Indonesia. And while there’s been a huge effort to stop deforestation there, it is still rising. Out of 14 large palm-oil buyers Greenpeace surveyed, Nestle and Ferrero have made the most progress and Colgate-Palmolive, Johnson & Johnson and PepsiCo scored the lowest. The others are in the middle: Danone, General Mills, Ikea, Kellogg, Mars, Mondelez, Orkla, Procter & Gamble and Unilever. While rooting out bad actors in massive supply chains is a major undertaking, not one company has yet to publish a full list of their palm oil suppliers, for example. In contrast, most palm oil traders that signed the Indonesia Palm Oil Pledge have mapped their supply chains down to the mill level and list suppliers on their websites. “So far, companies have been focusing on tracing the palm oil they buy to the mill and then to the plantation where it was grown. That is just the first step towards addressing the problems in companies’ palm oil supply chains. In 2016, companies need to start actively monitoring their suppliers for deforestation, peatland destruction, labour issues and social conflicts – and should take swift action against persistent offenders,” says Greenpeace. They also need to start sourcing certified sustainable palm oil. Read our article, In Spite of Zero Deforestation Pledges, Fires Rage in Indonesia.